Ready for some goofy FaceTime humor? Of course you are! Who doesn’t like to be silly sometimes? A reader sent in this hilarious picture which pokes fun at FaceTime, the video chat feature included with the iPhone and iPod touch (and soon the iPad). 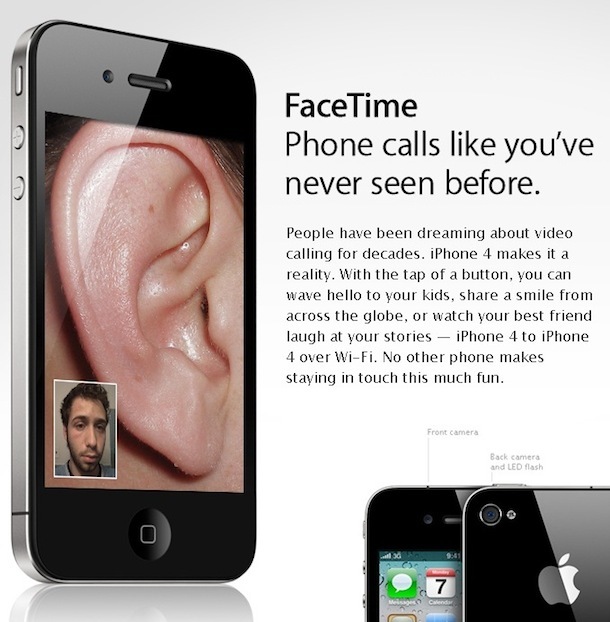 The tagline on the image is “FaceTime – phone calls like you’ve never seen before” and the image is a giant close-up of an ear. In case you don’t get it, the FaceTime camera on the iPhone and iPod touch is located on the front near where your ear rests, so if you just initiated a FaceTime call holding the phone up to your head as usual the recipient would get a lovely view of your ear canal. Inspiration to keep your ears clean maybe? Or more like, a reminder to pull your iPhone or iPad away from your head if you’re going to use a FaceTime chat! This might be more fitting on the iPhone 4 joke page but hey, FaceTime expands far beyond the iPhone now. Not sure of the origin of this image, but it’s pretty funny! If you happen to know the source, share it with us in the comments. Otherwise, thanks for sending this in, Kevin. Is disabled, so I could only laugh 😂 about such calling. I use another possibility to call some friends, Skype, Viber or Telegram.